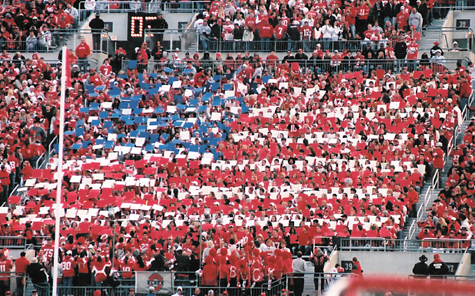 The day before Veterans Day, students in the “Block O” section of Ohio Stadium show their patriotic pride during the Buckeyes’ Nov. 10 game against Illinois. Ohio State University junior linebacker Marcus Freeman (No. 1) and sophomore safety Anderson Russell (No. 21) bring down Illinois junior running back Rashard Mendenhall. The Bucks fell short of victory in their Nov. 10 matchup against the Fighting Illini. The 28-21 loss knocked OSU out of its No. 1 ranking. Todd Boeckman rears back to throw in Ohio State University’s Nov. 10 game against Illinois. The junior quarterback threw for 156 yards and three interceptions on the day. The Bucks lost the contest, 28-21.